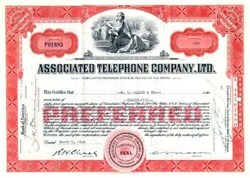 Beautifully engraved certificate from the Associated Telephone Company, Ltd. of California issued in the 1940's. 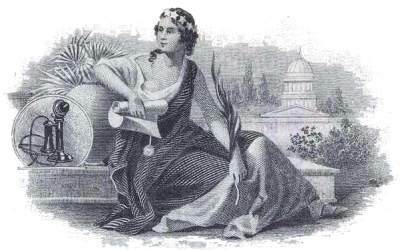 This historic document was printed by the Jeffries Banknote Company and has an ornate border around it with a vignette of an allegorical woman sitting holding a piece of paper next to an old telephone with the capitol in the background. This item has the printed signatures of the company's president and secretary and is over 57 years old. Vertical cancellations on left side. GTE was conceived as a corporate entity in 1918 when John F. O'Connell, Sigurd L. Odegard and John A. Pratt purchased the small Richland Telephone Co. in Wisconsin. The partnership became a corporation two years later, with the acquisition of other Wisconsin telephone properties. Later, the corporation purchased a Long Beach, Calif., telephone company, and a holding company called Associated Telephone Utilities Co. was organized in 1926 to serve as an umbrella for the Wisconsin and California properties. Associated Telephone Utilities served 500,000 telephones before the stock market crash of 1929 and the Great Depression that followed. Depleted financial resources forced the corporation into receivership in 1933, but it emerged two years later, reorganized as General Telephone Corp. The Missouri roots of Theodore Gary and Co. stretched back even further than those of Associated Telephone Utilities. Gary purchased the Macon, Mo., telephone exchange in 1897. Bitter competition developed when American Bell Telephone Co., AT&T's predecessor, tried to wipe out the independent telephone companies, sometimes leading to physical violence. The resolution of this conflict was the previously mentioned 1913 Kingsbury Commitment. In the meantime, Gary was acquiring domestic and international telephone companies at a rapid rate. Theodore Gary and Co. and General Telephone were the two largest independent telephone companies in the United States when they merged in 1955. Sylvania Electric Products began modestly in the 1910s in Massachusetts and Pennsylvania as a renewer of burnt-out light bulbs. Operations in both states moved on to production of new lamps and then to vacuum tubes in the 1920s, when radio broadcasting became increasingly popular. In 1931, the Massachusetts and Pennsylvania companies merged to become Hygrade Sylvania Corp., later Sylvania Electric Products. By the time it merged with General Telephone in 1959, Sylvania had become a leader in electronics, lighting, television and radio, and chemistry and metallurgy. After this 1959 merger, the company became known as General Telephone & Electronics Corp. Donald C. Power, the first major architect of what was to become GTE, engineered General Telephone's mergers with Theodore Gary and Co. and Sylvania. As head of General Telephone, Power advocated a decentralized management, and operations of the three companies were not integrated. In addition to telephone company operations, the conglomerate-styled business participated in a diverse range of enterprises, producing a remarkable range of products over the following decades, including halogen automobile headlights, cutting tools, telecommunications equipment, cameras, television sets, atomic-reactor fuel elements, anti-missile defense systems, and space frame systems for buildings. During this time, the holding company, based in New York, became known as GT&E Corp. In March 1970, blasts ripped through the headquarters buildings of GT&E and two other companies in New York; the terrorist group responsible was protesting the companies' participation in defense work at the height of the Vietnam War. In December 1970, GT&E announced that the company would move its world headquarters to Stamford, Conn. In 1971, the company adopted a new corporate symbol that became a widely recognized logo in the years to come, featuring the initials GTE placed inside a blue, rounded rectangle, and the company formally changed its name to GTE Corp. in 1982. In 1981, the company sold its electronics holdings to North American Philips, a subsidiary of N.V. Philips, Europe's largest electronics company. Meanwhile, in moves in the telecommunications businesses, GTE Mobilnet was formed to construct and operate cellular systems in 1981 (the first customers were served in 1984 in the Indianapolis area, and in 1989 GTE was the first cellular provider to offer service nationwide). In 1983, the company bought infant long-distance carrier U.S. Sprint from Southern Pacific Co. Five years later, GTE sold its controlling interest in what was then called GTE Sprint to United Telecommunications Inc.; the remainder was sold in 1992. By the end of the '80s, GTE was a corporation with annual revenues exceeding $17 billion, employing more than 159,000 people in various telephone and manufacturing operations throughout the United States and some 40 other countries. GTE and its business operations had spanned the turbulent years from the industrial revolution to the beginnings of the information revolution.